In 1960, a Blue Ridge Mountains country singer named Josiah Cephas Weaver headed to Florida, settling into a Dunedin home with more than 550 feet of waterfront on the St. Joseph Sound, and a view of Caladesi Island State Park. In 2004, Weaver moved again, but rebuffed offers from developers for his property, instead offering the land to the city for preservation as a park. The Trust for Public helped the city preserve the property in late 2008 with funding from the county and the Florida Communities Trust, a source we helped create in 1991. Opened to the public in 2011, Weaver Park features more than 12 acres of submerged waters and undeveloped coastal vistas–some of the last in Dunedin–and serves one of the country’s most densely populated counties. 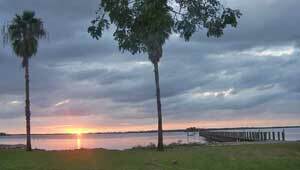 The park is owned and managed by the City of Dunedin, and provides residents and visitors with direct access between the popular Pinellas Trail and the Gulf of Mexico. A 725-foot long pier that extends over the water is a place to fish and watch the Florida sunsets. Future plans include building a canoe/kayak launch, trailside bathroom facilities and two picnic pavillions. Eventually, visitors will also be able to enjoy a museum and nature center that will be converted from a house located on the property, built in 1915 by the famed naturalist Dr. Willis S. Blatchley.